I'm not a computer "geek" (no aspersions intended) but I was glad to have discovered GWX Control Panel from an article on rensedotcom a few days ago. However, prior to that discovery I had already done Google searches for how to stop Windows 10 from being installed on my 8.1 desktop. Unfortunately, I had given Microsoft permission to alert me when it was ready for my pc clicking on their icon on the taskbar. That was before I read many warnings about what I would be subject to once I gave my permission. A few sources mentioned two updates to be aware of and once they appeared to delete them. The updates are KB3035583 and KB2976978. Shortly after I saw the numbers appear on my installed updates. "Is Get 'Windows 10' app running? - (App not found.)" 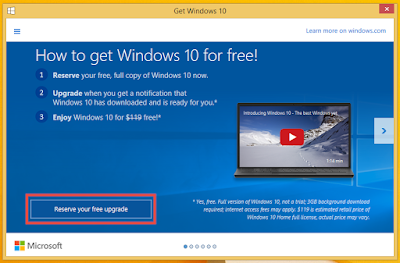 "Is Get 'Windows 10' app enabled? - (App not found.)" "Are Windows Update OS upgrades enabled? - Yes." "Windows 10 Download folders found? - No." "Size of Windows 10 download folders: - (not found)"
Below the above are some enabling lines "blocked out" by a foggy grey. I don't see a box for attachments so I can't include the screen print of it. Thanks for providing an alternative to help control the MS juggernaut. @nyceddie - Immediately below the "Size of Windows 10 download folders" line are two buttons that you can use to open the hidden folders if they exist. If the folders don't exist, those buttons are "grayed out" and therefore unclickable. Judging by the settings you listed, it sounds like the only feature you need to worry about right now is the "Disable Operating System Upgrades in Windows Update" button. 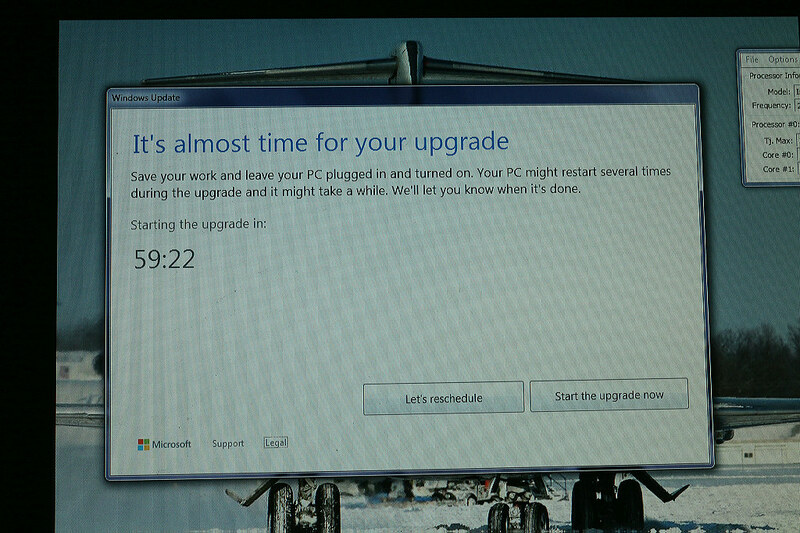 Use that and restart Windows if it recommends that you do. That will put some settings in place to protect your PC from unwanted upgrades. But you don't currently have the "get windows 10 app" or the hidden install folders at the moment, so you're in good shape. Everytime I restart my computer, GWX reports that "Are Windows Update OS upgrades enabled" are set to Yes, even though I have repeatedly selected the "Disable Operating System Upgrades in Windows Update". Whenever I select this, GWX requests an restartm which I do. Upon that restart, GWX shows "Are Windows UPdate OS upgrades enabled?" as No, but upon the next startup of my PC, it's reset to Yes. @Wil - Can you please use the "Save Diagnostic Info" feature the next time it's reporting that the features are enabled again and send it to me? You can get to it by clicking the icon in the upper-left corner of GWX Control Panel. It will save a TXT file to your desktop with the information I need. I have heard a few reports of people observing settings changing on them, but we don't know what Windows components are doing this yet. Thanks for a really useful utility. I've got two W7 PCs here in France and my research shows that one is definitely incompatible with W10 and other owners of the second report on forums a host of problems with incompatible drivers when they've tried upgrading. Despite declining W10 on both machines, Windows update managed to download 5.4 GB of files to one of them before I was able to halt the upgrade process by uninstalling 2 updates, hiding them, and temporarily changing WU settings to manual. I hope that GWX Control Panel will now allow me to keep W7 without having to jump through too many hoops. W7 does everything I want - I'm prepared to move to W10 when I have to buy my next PC, but have no need to do that yet. Living in rural France and having to rely on a satellite broadband connection with download data capped at around 8.5 GB per month, a huge download like W10 is a real pain. I know that many light satellite users over here have data download capped at around 3.3 GB, so you can imagine what problems these W10 upgrades are causing for them!!!!! @Tippy - This is a real problem (with Windows, not with my program) that I am going to begin addressing in the next update. Microsoft has recently (within the past couple of weeks) pushed down some changes that actively reset some of the settings that protect you from Windows 10. I don't know all of the culprits yet, but the next release of GWX Control Panel will deal with some of them at least. Hi, and thanks a lot for the effort you put into your site. I have been looking for a while now for some sort of updated blacklist of updates that will trigger the upgrade. I went through a rough few days getting my machine back to 8.1 after a bad upgrade experience due to some software combinations I need to use that just aren't ready for Win10. I'm hoping this will be preventative for future ambiguous updates that might trap me. If you do keep a list of the KB's that are related to the upgrade or know where I could find one I'd appreciate it. Thanks again. When I need to run Windows 7, I run it from VMWare Fusion on my Mac (10.10.5). 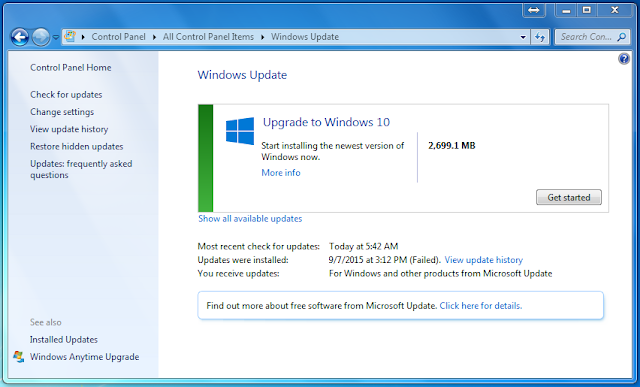 I don't want to upgrade to Windows 10, but my VM, when I launch it from Fusion, is set to automatically update. Is there a way, during the boot process or soon afterwards, to stop this so I can change the setting to not automatically install updates and launch Win 7 instead, so I can install your app? This auto-install of Windows 10 could be a real problem because in order to run Windows 10, if I actually wanted to, I would have to upgrade my current version of Fusion first. @femalekryptonite - I've tried to take an approach of not trying to keep up with which Microsoft patch is doing what, but instead just take care of specific OS symptoms/behaviors as they arise. That might not be sustainable if Microsoft gets even more aggressive with their strong-arming, but at the moment I do not really know which updates need to be avoided other than the notorious KB3035583. This might change in future, though. 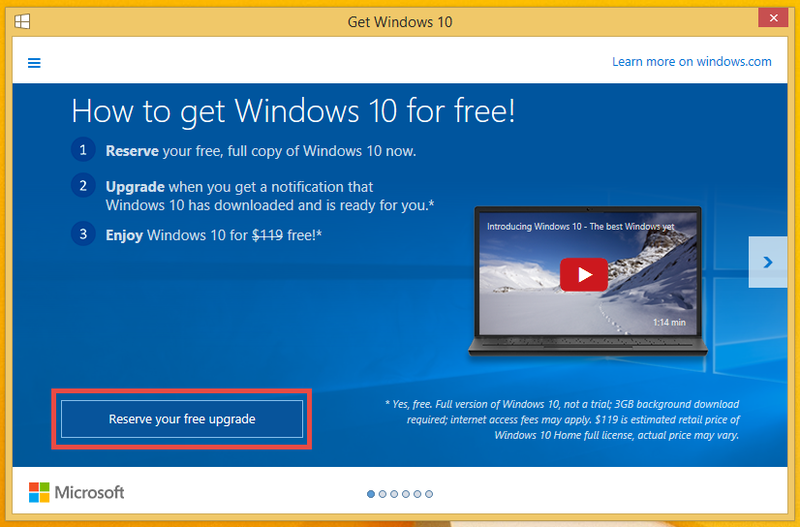 @Gary B - When you say the VM is set to automatically update, do you mean that your Windows image is claiming that it's about to upgrade you to Windows 10, or just that Windows Update is configured for automatic updates? If it's the latter, you should be able to just go to your Windows Update control panel as soon as you log in and then click Change Settings, and then specify how you want Windows Update to behave. If it's an imminent Windows 10 upgrade you're talking about, you SHOULD be able to run GWX Control Panel as soon as you log in, use "disable os upgrades in windows update" and then restart the VM as instructed. It's not clear to me from your wording whether: << The Disable Operating System Upgrades in Windows Update feature puts the correct settings in place to keep your control panel from being hijacked by the Windows 10 Upgrade, and that alone (followed by a Windows restart) should be enough for most people. Sometimes, however, the Windows Update subsystem needs to be refreshed in order to display the correct updates, so that's what Clear Windows Update Cache is for. >> means that Windows 7 will stop getting it's normal Windows 7 updates or not. I have this set to "Notify but don't download or install". If this is disabled, will I still be notified about Windows 7 related updates and can then pull them down when ready or does it block all Windows updates? @Huwyngr - Hmm, I wish I knew a better way to word that stuff; I do understand how it can be unclear. Anyway, "Disable OS Upgrades in Windows Update" does not disable the Windows Update feature at all. 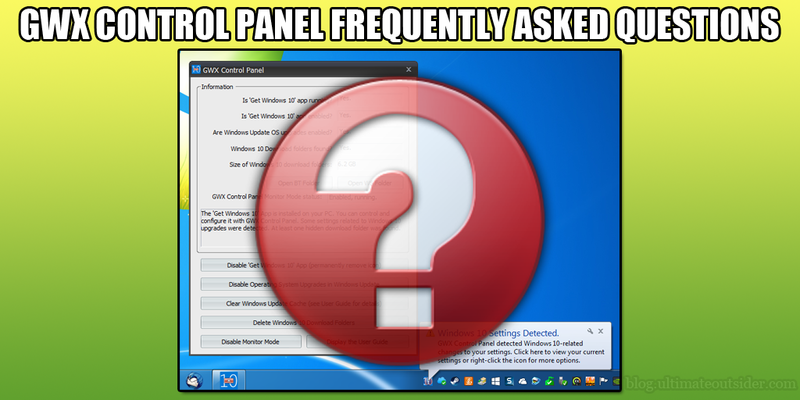 It simply puts some Windows settings in place that instruct Windows Update not to allow Windows 10 to hijack your control panel or accidentally upgrade you to Windows 10 via Windows Update. Using that feature of GWX Control Panel will not alter your "notify but don't download or install" setting; all that will continue to work normally. Thank you for helping us defeat MS Bullying. When the updates are disabled, are we also disabling 'legitimate' Win 7 updates too? If so I do we go back to 'normal' ie Pre WX? @SSD - The "Disable OS Upgrades" feature doesn't disable your Windows Updates. It just puts some settings in place so that Microsoft doesn't hijack your Windows Update control panel with Windows 10 stuff. I need to come up with some better wording for that feature because I understand how it can seem like it means something else. I apologize if I am being repetitive. I want to make sure I do this right. I am set up Window's Update to "automatic". I checked Windows 10 however, to make it an option, then right-clicked it to eliminate it as a download altogether. Can't remember what it said but right-clicking gave the option to dismiss it. It, of course, keeps coming back. My question: now that I have downloaded your software, should I change my auto-settings for Windows Updates to "notify but do not install"? I don't want to miss the important updates. Thank you for the software; I don't like a company taking over what should be my choice. From what I have read though, they will stop supporting all but Windows 10 in the near future so we will be forced to upgrade to 10 or dust off the old Mac's. @nicole - The safest course of action is to use GWX Control Panel's "disable OS upgrades in windows update" feature (note, this does not disable Windows Update or change your Windows Update settings- it only tells Windows not to allow Windows 10 upgrades via the Windows Update process). 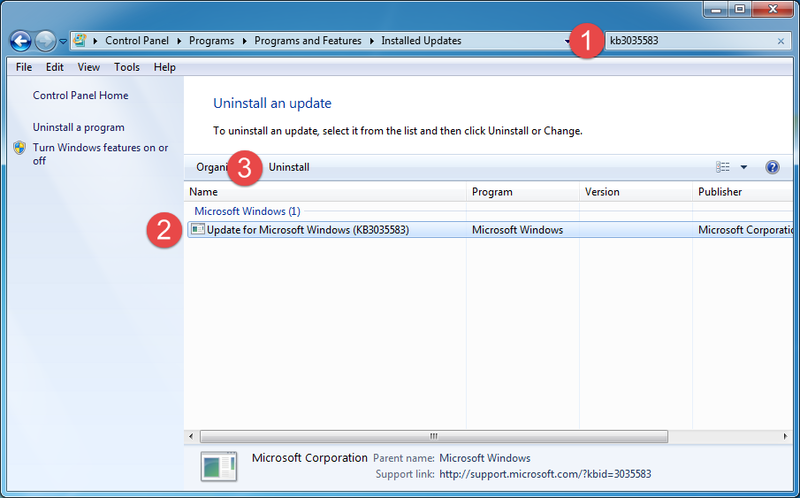 And then change your Windows Update control panel settings to only download or only notify when new updates are ready. My program can prevent you from that "Upgrade to Windows 10" thing, but we don't know what else Microsoft has planned next, so it's safest right now to review which updates they want to install instead of just taking everything they push automatically. I can confirm that after taking this action, whereas MS was listing a bunch of updates supposedly for Win 7, they were actually Win 10 installation files when you tried to install. 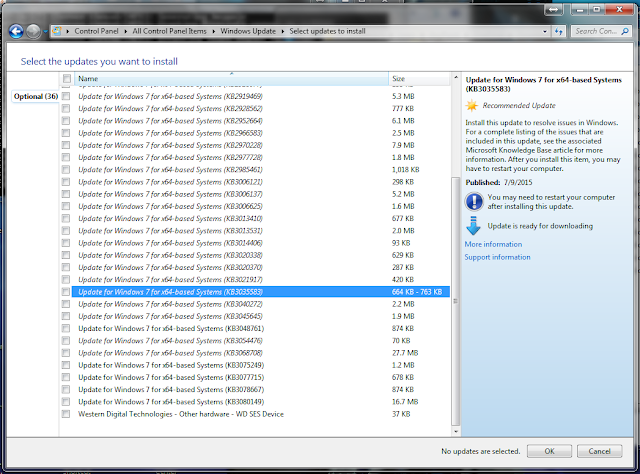 I could not selectively pick Win 7 only files to upload as it would always report Wx is being installed. Infact it was doing this while I was doing something else and without my instruction. After running your prog and basically obliterating any WX files that had already loaded, the new updates (set to only notify when updates are available) began uploading for Win 7 only (at least that is my hope). On another respectable Thinkpad W500 laptop machine I foolishly became convinced that I should install WX. I happened to have a second extended display connected. When this WX crap had installed it had detected a third 'ghost' display. In between the re-boots WX defaulted the display to this third ghost screen which of course did not exist, so I was looking at TWO blank screens, waiting for something to happen. Of course with no info I started to panic and did several re-boots until finally an error came up on the screen and I was able to restore to a previous point. After some time I also discovered that WX had changed my video drivers and had to re-load the original ones. Basically it totally screwed up my PC and I was able to use your prog to rid the WX crap out of my machine. At no point did the WX launch say that a second extended monitor should be disconnected. And that they were going to screw up my video drivers. I've really got problems with windows update, when I start windows update, I get the pesky windows 10 failed to install, and I do not want it! I understand that it will stop Windows Update from installing W10, but will it stop it from downloading the update files ? @Jandi - The Save Diagnostic Info feature (see the user guide/announcement post for instructions) outputs some info you can send me that tells me which settings were detected on your PC. The next version of the program will actually include this info in human-readable format. @Mark - The "Disable OS Upgrades" feature does appear to prevent the secret background downloads from coming to your system. I've got around six test systems here that are online all the time and still have never received the Win 10 download files. The thing is, Microsoft has said they have plans to force those downloads onto more PCs in future, so it's possible they might change their tactics and do something that we can't override. I hope it doesn't come to that. You will likely always be able to use GWX Control Panel do delete the files though. Does your program have the option of command-line switches so that the process can be automated to periodically run and reset the options? If it currently does not, would you please consider doing so for a future version? @Andrea - That is a popular feature request, and I will probably implement something like that in the future. In order for an automatic version to work it would need admin rights (like running as a service or from a privileged admin account). It def. won't be in the next version (I am half-way finished with it) but possibly in a subsequent release. Great program, and so glad that you are keeping it as up to date as possible. I have the .exe version. I also have multiple Windows 7 computers. It appears that if I do NOT use the new 'Monitor Mode' I can run the program on all my computers from a USB stick--therefore only needing to update one installation. So far it seems to work fine. Is there a problem that I might be missing doing this? @LexBlogger - Nope, that's a perfectly valid way to do it. Even if you happened to accidentally enable Monitor Mode while running the program from a USB drive, it would just fail silently on Windows restart- so harmless all around. I attempted to start monitor mode from the running standalone program, and got "Encountered error 5 attempting to change monitor mode" since the status is "Disabled, not running". This occurred both before and after a restart with version 1.6.0.1 just downloaded today, on Windows 8.1, 32-bit. @Josh: Thanks for the quick response! Running as admin got it going. Do I need to do that each time I start the PC? If so, could I put a shortcut for it in the Startup sub-directory, and will it "remember" the setting to run as admin? @arocee - I'm not really sure what will happen for you, since it shouldn't have required admin permissions to begin with. (Then again, I still need to look into what happens for limited/standard user accounts.) Please let me know what you find! What I have done on the other 2 is just pin it to the task bar, then manually start it after Windows starts up. Since I sign on with the same non-privileged Id all the time, I hope that works to catch any new efforts by MS to re-activate it. There are recent stories around the 'Net about a variety of ways MS is trying to stealth the upgrade into PC's - one mentions you, Josh, and your GWX tool - and it looks as though that will be a moving target. I have been in the habit of checking each patch in the list after they show up - no automatic or mass updating allowed - and if any mentions W10, or "telemetry", I hide it, and in all cases wait at least a week (sometimes months for non-security patches when I'm busy ;-} ) before applying. I hope that will catch any of the tricks MS uses. I have tried the W10 upgrade on one PC, HP Stream 7 tablet, and did not like all the changes (yeah, I got used to the Win 8.x UI, and don't want to start a new learning curve just now - using a bunch of different Linux UI's probably prepped me for that ;-}), and it definitely seems unfinished in various ways from what I saw, and have been reading, so I rolled it back to 8.1. GWX Control Panel running ok on 3 computers. On fourth (Windows 7 Home Premium) will not start. No error messages just does not start. Any prereqs? Any ideas. @Wanderer - a few ideas: The very first time you launch the program it opens an "End User License Agreement" dialog that can sometimes accidentally appear behind other windows. (I am fixing this unexpected behavior in version 1.7). Another possibility is window position coordinates... you can rule this out by using the GWX Control Panel uninstaller (found in Programs and Features) to fully remove the program, and then re-installing it. The next time you launch the program it should have fresh window coordinates in the middle of your monitor. If you agree to launch GWX Control Panel immediately after installation (if you let the final page of the installer to launch the program), GWX Control Panel is still running under the Administrator account. If you use one of the GWX Control Panel features that make system-wide settings changes, the program requests an administrator password, and anything else you do in that running instance GWX Control Panel occurs under the admin account. If the Standard/Child account user uses "Run As Administrator" to launch GWX Control Panel, all actions in the program affect the admin account, not the current user. Basically any time you have to enter a password in order to use GWX Control Panel, it means changing Monitor Mode settings won't affect your current user account. The above behavior also affects the "Save Diagnostic Info" reports that you can access from the pop-up menus of both Monitor Mode and the main GWX Control Panel window. If you generate a report to send to me, please make sure to run GWX Control Panel normally (not as admin) before saving the report. Restarting Windows has no effect. Neither the installer version nor the stand alone version will run. Windows tries to start the program but never does. No log but I can see Avast reacting to the start command. Removed antivirus but no change. Account is an administrator. "Run as administrator" has no effect, same behavior. System is Windows 7 Home Premium SP1 32-bit and is up to date as of 12/23/2015 except for Windows 10 nag and stealth "fixes". @Wanderer - Crazy stuff, man. The UI portion of GWX Control Panel is completely basic, standard MFC code that should run on any Windows computer from Vista on. I don't have any idea what's going in on your case, sadly. V 1.7 will be posted soon; perhaps give that a shot? 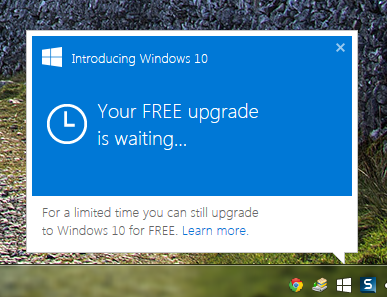 "Your upgrade to Windows 10 is ready". 1.6.0.1 did indeed fix that problem. Win 7 Pro. Great job with GWX Control Panel! So frustrated with the W10 push, especially since I support 5 laptops and worry someone will accidentally click the upgrade button. Read many blogs/solutions etc, very messy and maintenance headache. Saw your product, downloaded v 1.7.0.1, liked it, and have now installed on 3 laptops with great success. Did all options but the 'delete Windows 10 programs' option because not sure if deleting them destroys chance for eventual W10 upgrade. Kudos, and goodbye MS insidious nag,nag,nag. Thank you and will donate if no nags for a week. @Ron - The Delete Windows 10 Programs feature will not prevent you from being able to upgrade to Windows 10, but in order to perform the upgrade you'll need to use Microsoft's free Media Creation Tool to download Windows 10 instead of the GWX/GWXUX method that GWX Control Panel takes care of. You can alternatively manually uninstall/reinstall the KB3035583 (or wait for Microsoft to re-push it again) to restore the GWX/GWXUS method. I was manually uninstalling KB3035583 and then waiting for it to get on the list to be d/l again & right clicking on it & choosing 'Hide' but I found that was not a final solution. On top of that, when I had users who had Win7 Home PC's & their OS does not come with GPEDIT. So I looked at installing it - Then a friend pointed me to your tool. I will be sending you a modest Paypal contribution as well, but I thought to drop you this note in appreciation. I too don't receive payment for the support I provide so I'm sorry my payment won't be large but it is sent with heartfelt thanks. @David - Thanks so much! Also, you'll be happy to know that the very latest version (just posted this evening) deletes all the files and scheduled tasks that KB3035583 installs, so even if the update sneaks on to your system, you can now delete it with a single click! Thank you for creating this tool! My computer is almost clean , but the GWX control panel tells me to find here what does it mean when " Error 31 attempting to launch your browswr" ? Hi, I have successfully installed and ran GWX Control Panel on my Win 7 box.. No issues, all is fine. Thanks for this! GWX Control Panel - Closes and configures the 'Get Windows 10' system tray application. has stopped working. I hope this helps! If you can tell me what the problem is, I'd be grateful! Thanks again for all your hard work! @Thwap nlm - I've never run the program on Vista before (obviously! )- the crash you're seeing is because my program's trying to use at least one Windows API function that is not available on Vista. I could code it to "elegantly fail" on Vista rather than crashing, I suppose, but there really is no value in it. Windows 10 can't upgrade from Vista, and Vista shouldn't be targeted by any of the Windows 10 annoyances that Win 7 and Win 8.1 have to deal with, so my program doesn't serve a purpose there. I'd recommend just using the uninstaller. I wondered whether it would run on Vista though, and I guess you've answered that! Hello, You give no details on upgrading your GWX Control Panel. I installed 1.6 and it is running. Should I turn off monitor mode or enable Operating System upgrades in Windows Update before I uninstall it? Should I install 1.7 over the top of 1.6? I want to use the standalone of 1.7 after uninstalling 1.6. 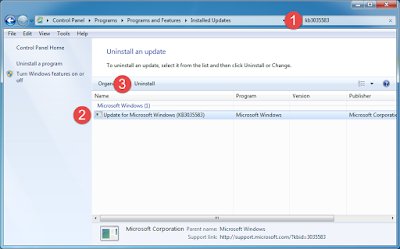 @Strangenews - If you want to switch from the installed version from standalone, yes, you should use the uninstaller. That will disable monitor mode implicitly. (Otherwise, if you use the 1.7 installer, it automatically upgrades your existing version and you don't have to do anything than just run the setup as long as you're the only user currently logged in.) 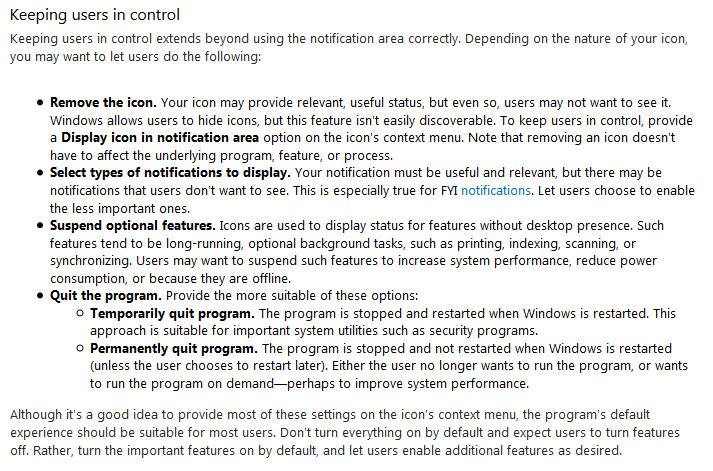 The "Downloading and installing gwx control panel" section of the user guide has some more advice. Thank you very much for responding so quickly. Your software indicates that none of the components for Windows 10 have been downloaded. It also reports the size of the Windows 10 download folder is not found, when in fact my own research shows there is a KB 2952664 folder located in C:\Windows\System32\catroot. These are software distribution packages, each containing hundreds of folders with thousands of files well over 12 GB. I cannot delete or rename this folder manually even after claiming ownership nor can Windows disk cleanup remove them, even when run in administrative mode. Could you elaborate on what these folders are doing on my hard drive and why your software doesn't see them........ Many thanks for your software and your advice. @Strangenews - Since the KB2952664 patch doesn't include any visible Windows 10 symptoms/behavior, it fell outside of GWX Control Panel's initial scope. (I allude to this in the "What it doesn't do" section of the user guide.) HOWEVER: I am starting work on the next major update for GWX Control Panel soon, though, and targeting KB2952664 (and its Windows 8 equivalent) is one of the primary new features. Strangenews indicated that his ....System32\catroot folder, which I had never looked at before, contained a KB 2952664 folder. I don't see any reference to any specific KB numbers in mine, but one of it's subdirectories (named with a whole series of letters and numbers) contains 2,254 'Packages' totaling 53 MB. These are of the 'Security Catalog' type, and have dates from 2009 (years before I had this computer built) through 12/30/2015. I looked up 'Security Catalog' on the Microsoft site, but that told me nothing that I could understand. What do these files do and can they, or should they, be removed? @LexBlogger - I am not aware of any public information that truly describes what all those files do. Through experimentation and analysis some folks around the world have observed behaviors such as the ability to intercept anything typed into a text control (although only Microsoft knows what ultimately happens with that information). KB2952664 and its Win 8.1 equivalent are like KB3035583 in that Microsoft constantly re-issues new versions of the patch under the same name. It has indeed been around for several years. Previous versions helped Microsoft collect data they used to guide users to Windows 8 and current versions obviously focus on getting people to Windows 10 (but it's more about data collection/analysis than actually interacting with users). Thanks for the prompt feedback. If someone with your knowledge is not clear what happens with the data, and since these files only take up 53MB on my hard drive, I'll just leave them alone. I belong to an embroidery Yahoo group, where GWX Control panel was recommended. I have a laptop running Windows Vista, and an embroidery software package, which I know does not run on more recent versions. So I keep this laptop just for that program. However when I try to install GWX I keep getting messages that tell me that the "procedure entry point could not be located in the dynamic link library". As I understand it, Microsoft does not attempt to install Windows 10 on Vista computers (same for XP), so there is no GWX Control for these operating systems. Somewhere on these threads Ultimate Outsider posted information to that effect. I have your GWX Control Panel downloaded. My problem is that I cannot find the button for diaabling OS Upgrades. Where is it? I have version 1.7 and Windows 7. I am new to computers. I also want to express my thanks for saving my computers from a MS Hack Attack. That's all Win 10 is. If you are using Win 7 and everything is working just fine, LEAVE IT BE! Even after they stop supporting Win 7 it will be good for another few years, just like XP didn't exactly explode. It was just fine. This is all more about how MS Exploits people and invades their working system so that they can screw more dollars out of you. GWX Control saved tons of hassle! Today MS tried to force me to install WX on both my 8.1 touch laptop and desktop pc. I installed your latest standalone and got the all clear reports on both. The laptop now launches as runs faster than it has for months - many thanks. The desktop had actually started the installation countdown clock, and after restarting the desktop an update started to download and is now stuck on the blue screen stating "working on updates, 30% complete, don't turn off your computer" this has not changed in 2 hours. At the suggestion of a friend,I just installed on my desktop that runs on Windows 7 your software that blocks Windows 10 installation. Many thanks! I have a friend whose computer runs on Windows Vista and she gets the same nagging about installing Windows 10. Will your software work on Windows Vista? @Nancy - Vista is not supposed to be getting notifications about Windows 10. The currently-posted version of my program DOES run on Vista, but I do not know how effective it would be- only because it's not supposed to be necessary on that operating system. One thing though- if your friend only sees these Windows 10 ads inside her internet browser, it's probably because she's visiting MSN.com or some other Microsoft-owned site, and those are ads delivered by Microsoft's web servers into your browser. I can't control what happens inside your browser- only what happens on your desktop and your Windows system settings. The workaround for this is to just avoid MSN and other Microsoft web sites. Although an ad blocker browser add-on MIGHT help.